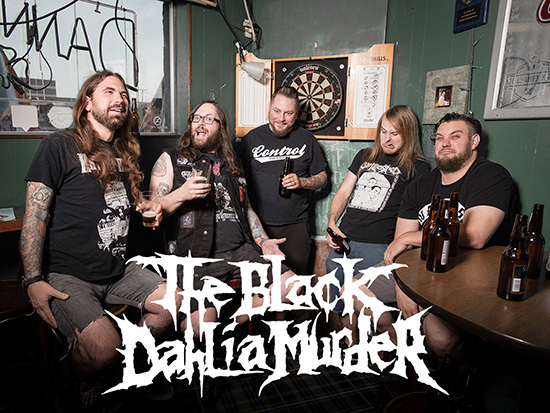 The Black Dahlia Murder guitarist Ryan Knight left the band. Frontman Trevor Strnad said: "When Ryan first joined the band, he drove from the hospital where his first child had just been born to begin practicing and writing with us, on the eve of the recording of our 'Deflorate' album. In his years with the band, he made a lot of sacrifices to be with us and uphold our insanely demanding touring and recording schedule…He always gave us 100 percent, and for that I thank him. He is an incredible musician and creative force…It was exciting to make new material with him, and his wealth of knowledge has left its stamp on the band's music forever. I always knew that his time in the band would be limited, and it has now come time for him to go home and be with his family. Ryan, being the stand-up dude that he is, told us of his plans to leave the band more than a year ago, and with heavy hearts we began to plan for The Black Dahlia Murder's future. We admire that Ryan went to such lengths to make his departure as easy on the band as possible, even going as far as to help us find a talented leadsman in Brandon Ellis – who has been lending us his tremendous guitar skills on the current TBDM tour…Knight is one of my best friends and I wish him the best in everything he does. He will always have a place here in the TBDM family. I look back at our time together with nothing but gratitude." Ryan Knight said: "After nearly 7 years with The Black Dahlia Murder, I feel the time has come for me to step down and focus on other aspects of my life. The decision to leave was very difficult, yet necessary I feel for me to ultimately be happy and keep moving forward. I feel very lucky to have had the best band-mates/crew (past and present) to traverse the world, guzzle beers, and bring the rock with every night…Thank you guys <3, I'd like to give a HUGE thank you to all our fans for being so cool to me over the years, and all the hardworking people over at Metal Blade Records for their support, and general badassery. In the meantime, I'll still be teaching guitar, working on new music, and just getting pretty domestic in general. Thanks again!"